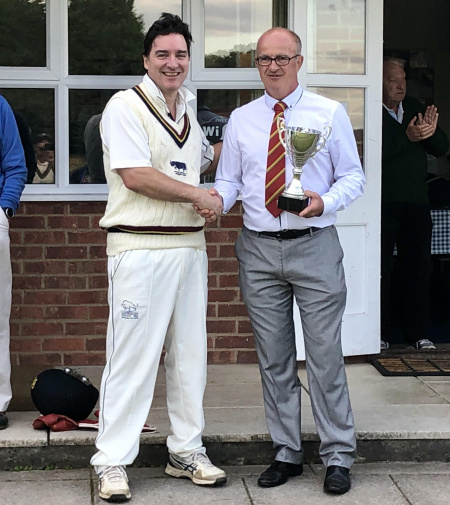 In only their 3rd season playing competitive Inter-County cricket, Oxfordshire 50+B completed a hat-trick of trophy victories by winning the Southern Counties Seniors Championship Final for the 3rd year running, a feat which has not been achieved before in the history of the Championship. Oxfordshire met Bedfordshire in the Final at the picturesque Marlborough CC ground and, after being inserted, were made to work hard by a good Beds attack in making 195 for 8 wickets from their 45 overs. Jonny Atkins top scored with 62 and shared a solid 2nd wicket partnership of 71 with Sam Mendes (31), whilst Colin Allen weighed in with a brisk 29 at the end of the innings. Naseer Ahmed took 3 for 36 for Beds. After 20 overs of the Bedfordshire innings the match was evenly poised with Beds on 80 for 3 wickets. However, their remaining 7 wickets then collapsed for just a further 50 runs when Neil Wilkins (4 for 16) and Stuart Bullen (3 for 36) combined to bowl a devastating attacking spell, well supported by their team mates in the field taking several memorable diving catches, Chris Panter taking the pick of the bunch one handed, after sprinting 30 yards and diving at full stretch deep in the outfield, leaving Beds 130 all out off 37.4 overs. Since being formed in 2015, Oxfordshire 50+B have now recorded 34 wins and suffered only 3 defeats against other County sides - an impressive record they hope to improve further in 2019.